While investors are waiting for the Fed’s decision regarding the rate hike, there has been no important economic reports in the US or Japan to influence USDJPY. 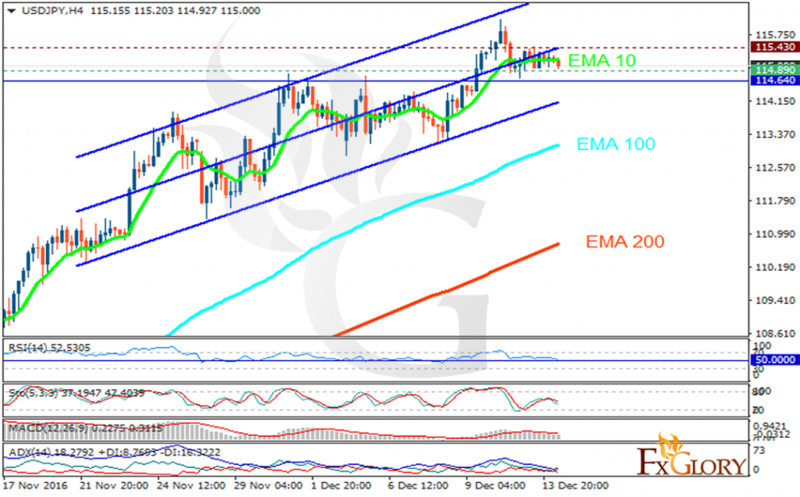 The support rests at 114.890 with resistance at 115.430 which both lines are above the weekly pivot point at 114.640. The EMA of 10 is moving horizontally and it is located above the EMA of 200 and the EMA of 100. The RSI is moving on the 50 area, the Stochastic is showing downward momentum and the MACD indicator is in positive territory. The ADX is showing sell signal. After short term pullbacks, USDJPY will continue its upward trend targeting 116.00 area.